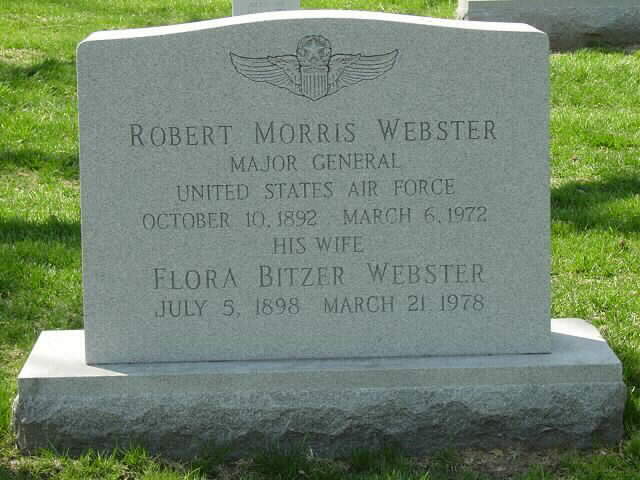 Robert Morris Webster was born in Boston, Massachusetts, October 19, 1892. Enlisting as a flying cadet on February 21, 1918, he attended the School of Military Aeronautics at Princeton, New Jersey, from March to June, and was then assigned to Chanute Field, Illinois. He attended the Aerial Gunnery School at Carlstrom Field, Florida, from October 1918, to February 1919; entered the Instructors School at Kelly Field, Texas; and was then assigned to the District Ordnance Office in Bridgeport, Connecticut, as a Reserve officer. Commissioned a second lieutenant in the Air Service, Regular Army, in July 1920, the following January General Webster went to the Long Island Air Reserve Depot, New York. That March he returned to Carlstrom Field, and moved to Brooks Field, Texas, in July 1922. Transferred to the Philippine Islands in October 1926, he served with the Second Observation Squadron at Camp Nichols, and a month later was assigned to the Fourth Composite Group there. In December 1928 he became an instructor with the Connecticut National Guard at Hartford. General Webster entered the Air Corps Tactical School at Maxwell Field, Ala., in August 1933. He graduated the following June and remained as an instructor. He entered the Command and General Staff School at FortLeavenworth, Kansas, in August 1937, was graduated the next June, and assigned in Washington, D.C., as chief of the Training Section in the Office of the Chief of Air Corps. In March 1942 he joined the Operations Division of the War Department General Staff there. He was named commanding general of the First Air Support Command at Mitchel Field, New York, in August 1942. The following April General Webster assumed command of the 42nd Bomb Wing in the Mediterranean Theater. In July 1944 he was appointed commander of the Allied Forces in Sardinia, Italy, and deputy commander of the 12th Air Force. Going to France in March 1945, he assumed command of the First Tactical Air Force. became commanding general of the First Air Force. He assumed command of the Eastern Air Defense Force,Continental Air Command, at Mitchel Air Force Base, New York, in September 1949. The following June he was appointed chief of the Air Section, Joint Brazil-U.S. Military Commission, at Rio de Janeiro, Brazil. Senior U.S. Air Force Delegate to the U.S. Delegation of the Inter-American Defense Board; and Senior U.S. Air Force Delegate on the Joint Brazil-U.S. Defense Commission. His decorations include the Distinguished Service Medal with oak leaf cluster, Legion of Merit, Silver Star, and Air Medal with oak leaf cluster. He is rated a command pilot, combat observer and aircraft observer. He was promoted to first lieutenant July 1, 1920; to captain Oct. 1, 1934; to major (temporary) March 7, 1936; to major (permanent) July 1, 1940; to lieutenant colonel (temporary) July 15, 1941; to lieutenant colonel (permanent) Dec. 11, 1942; to colonel (temporary) Feb. 1, 1942; to brigadier general (temporary) Sept. 18, 1942; to major general (temporary) Nov. 9, 1944; to major general (permanent) Feb. 19, 1948; with date of rank from Dec. 20, 1942.